Summer is here and with it brings more time for creativity, exploration and play. 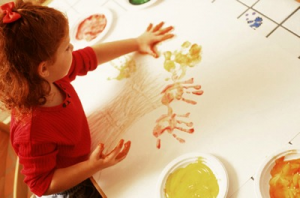 Kids love to draw paint, act, experiment, and design, and summer provides the opportunity to diverge from a structured school curriculum and allows time to delve into self-chosen projects that enrich and entertain. At our summer camp, Camp Summit, the emphasis is on having fun, observing nature, being with gifted peers, and playing in creative ways. We tie dye and doodle, draw from nature, plan skits, and create imaginary animals with mixed media. One high point is our Rube Goldberg room in which the entire room is transformed into one big machine – with pulleys, and levers and gears. The goal is to make a complex machine to solve a simple task, such as pouring water from a pitcher into a glass or shutting off the light switch. Keep in mind that kids need lots of personal free time to explore and play, test and design. Yet they also thrive from having a playmate, and it’s great if that playmate can at times be you! Parents jumping in and trying out a variety of creative activities outside of typical comfort zones will model how to take risks and develop more personal creative abilities – anytime and anywhere. Enjoy!